Facebook: app to no good? 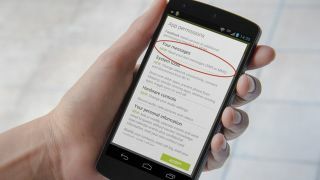 Facebook's latest Android update requires you to give it the fairly invasive permission to read your text messages. It was spotted and brought to the internet's attention by a Reddit user, who assumed that the inclusion of access to your phone's SMS and MMS messages was to allow Facebook to skim off more information about you for yet more targeted advertising. But Facebook tells us it's actually for a much less alarming reason. When we spoke to the social network, a spokesperson pointed us in the direction of Facebook Android engineer Franci Penov's response to the post. He explained that the READ_SMS permission is used to "automatically intercept login approvals SMS messages for people that have turned 2-factor authentication for their accounts, or for phone confirmation when you add a phone number to your Facebook account." If they could, Facebook's engineers would make the permission more specific, so that the app can read only the messages sent from a specific number (although Penov also notes that this would cause a lot of problems given that the numbers used vary from country to country). The other thing on the engineers' wishlist is to tailor the required permissions based on your own preferences - so if you didn't opt for 2-factor authentication on your Facebook account, the app wouldn't request permission to read your messages. So while the social network steered clear of explicitly telling us it's not skimming your messages for marketing reasons, a relatively innocent explanation for the rather alarming sounding request does exist.